Whether it’s a need to clean cars, decks, patio furniture or driveways, homeowners now have access to an all-new, affordable power washer courtesy of Generac Power Systems, a leading designer and manufacturer of engine-powered products. The 3100 PSI unit, in particular, features Generac’s PowerDialTM technology, allowing users to adjust water pressure settings with the spray gun. 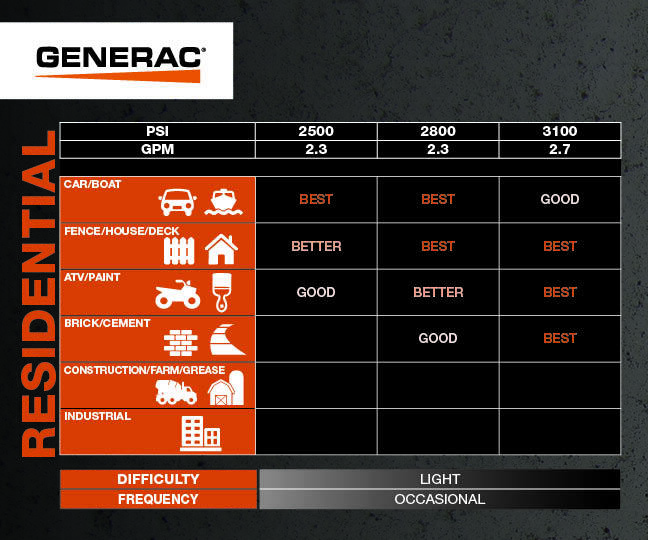 Known for its commitment to innovative engineering, Generac designed the power washer with user needs in mind. Most impressively, the spray gun can easily be adjusted between four application settings to immediately arrive at the ideal pressure setting for each cleaning task. Also to the benefit of users, Generac is the only power washer manufacturer to integrate an inverted, easy-pull trigger on the spray gun, which significantly reduces fatigue during prolonged use. Another important feature is the integration of a horizontal-shaft engine which positions the pump well above the ground and within easy reach. As a result of improved access to hose connections, users won’t even have to kneel down to attach hoses, which will be a welcome relief. Generac tests every power washer unit before leaving the production line. This 100 percent end-of-line testing checks each unit for pressure, flow and engine RPM. 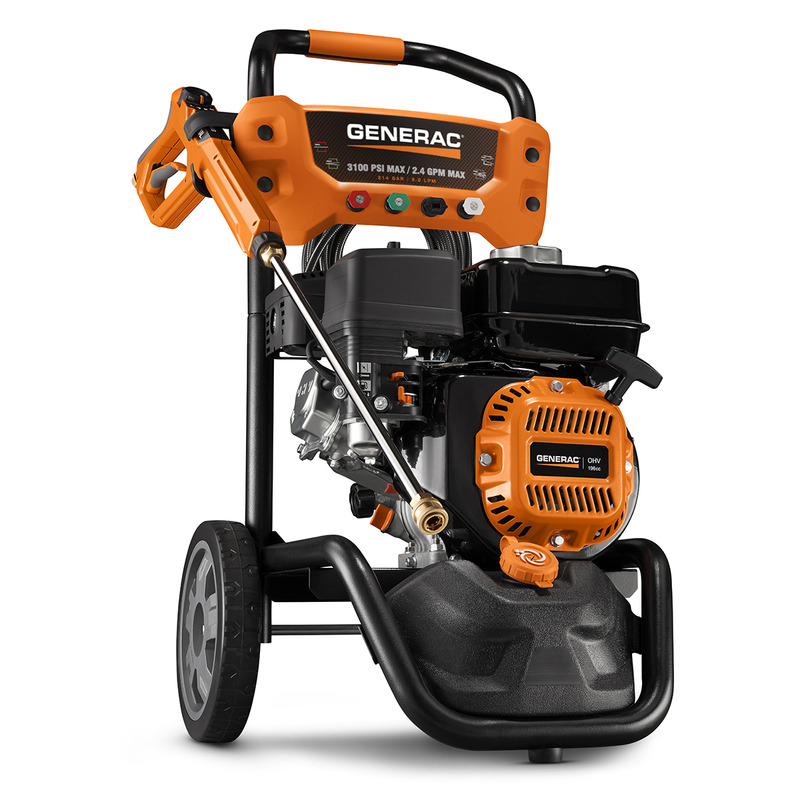 Ideal for a full range of tasks, including heavy-duty chores, the 3100 PSI model with the innovative PowerDial is one of three units in Generac’s new pressure washer line. The new line also includes a 2500 PSI unit ideal for light-duty tasks such as cleaning patio furniture, as well as a 2800 PSI unit for medium-duty chores like cleaning decks and home siding. The 2500-3100 PSI power washers are available at participating retailers and dealers starting at $279. Click here to find the nearest dealer or retailer, or visit www.Generac.com for more information. Media: Click here to download product documentation for the 2500-3100 PSI power washers. Click here to download a high resolution pressure washer image and the “Good-Better-Best” infographic that quickly identifies the power washer that best meets end-user needs. *Built in the USA using domestic and foreign parts. Generac Power Systems (NYSE: GNRC) is a leading global supplier of backup power and prime power products, systems, and engine-powered tools. Back in 1959, our founder was committed to designing, engineering, and manufacturing the first affordable backup generator. Fifty-seven years later, the same dedication to innovation, durability and excellence has resulted in the company’s ability to expand its industry-leading product portfolio into homes and small businesses, on job sites, and in industrial and mobile applications across the globe. Generac offers backup and prime power systems up to 100 MW, and uses a variety of fuel sources to support power needs for our customers. We are proud to be named in back-to-back years the Frost & Sullivan 2014 and 2015 North American Natural Gas Generator Set Company of the Year.